Like every other industry transformed by the pace of digital change, office technology solutions have changed from standalone machines that put ink on paper to an enterprise-wide, integrated set of technologies. When these solutions work, colleagues can share ideas, get things done, and make the most impact on your customers. Our mission is to be the one place where everything works. This means being a one-stop shop for your team, helping you manage everything from your copy-print solutions to your whole integrated IT environment. Early last year, we introduced you to the SumnerOne name. As part of this transition, we’ve kept the names Datamax, UDP, and Copying Concepts paired with our new name. However, we’re now saying goodbye to the co-branded names and moving forward as SumnerOne. The Sumner name pays tribute to the fact that we are the largest family-owned office technology company in the Midwest. Bud Sumner founded our company in 1955 and today, we are operating under the third generation of the Sumner family. Being family-owned means that we value our people, our relationships with our customers, and the communities we serve. The “One” in SumnerOne speaks to our mission to be a customer’s one source of solutions for managing the flow of information in the modern workplace. Whether that information is nestled in the cloud, on a connected device, or on paper. We are bringing more solutions than ever to our markets and have the expertise to offer these in one integrated way. SumnerOne represents the best parts of the legacy of Datamax, UDP, and Copying Concepts unified under a single name. For decades, businesses in the Greater St. Louis and Kansas City areas have associated these brands with having a trusted partner. That foundation of trust continues under the SumnerOne banner and simply allows us to reduce complexity and focus on serving your business and your people. We are proud to maintain a local presence in each area that SumnerOne serves. We have local sales teams, local service, local customer care, and local warehouses. While we continue to grow, we remain committed to maintaining full-fledged local teams to stay as close to our customers as possible. Along with our brand updates, you’ll see our website, www.sumnerone.com become the one place you go online to find us. 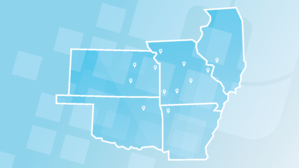 Within the Location hub, you can easily navigate to any of our different locations across the Midwest. This enhancement will give all of our customers easy access to find vital information and resources that correspond to their location. Visit your nearby location to find relevant contact information and updates. Should you have any questions about this transition, please contact us. To stay up-to-date about the latest with SumnerOne, subscribe to our blog for updates.